Here are MP3 sample extracts from the System 7's new PositiveNoise 12" single (AAWT706). Click on the A-Wave.com button if you wish to purchase the vinyl online (available NOW!). The A-Wave webshop page is now hosted by planetgong.co.uk. To check the details of Planetgong's online sales system please read this. 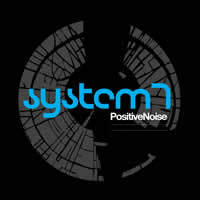 POSITIVENOISE is available from June 6th 2011 on Beatport as a download in MP3 and WAV format.